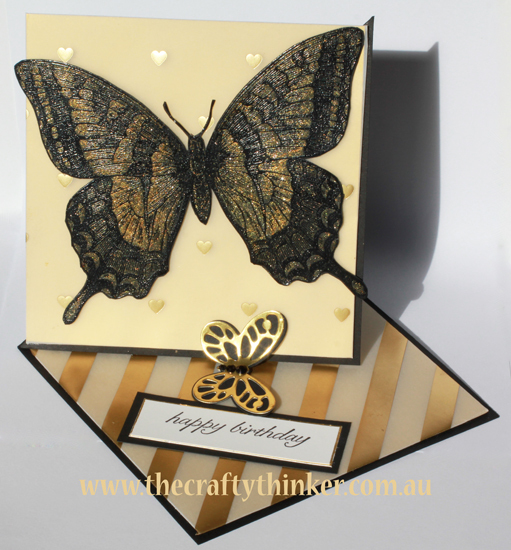 I so enjoyed making the swallowtail tri-fold a few days ago that I decided to make another card featuring the Swallowtail stamp and the Gold Fancy Foil Designer Vellum! It's easier to see where I used the bleach in this close up. This is a birthday card for my loving mother-in-law who loves the drama and elegance of black especially combined with metallics or red. For her 85th last year I used black and silver so I've changed to gold this year! 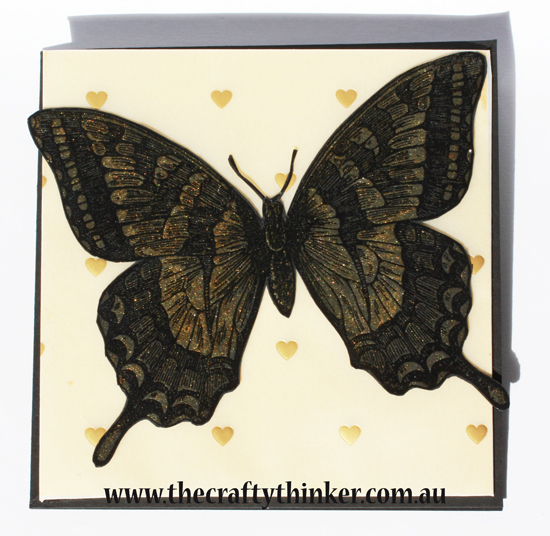 I heat embossed the Swallowtail stamp in clear onto Basic Black cardstock. I then bleached it before adding Gold Wink of Stella. It's so shimmery and glamorous in person but really hard to photograph! 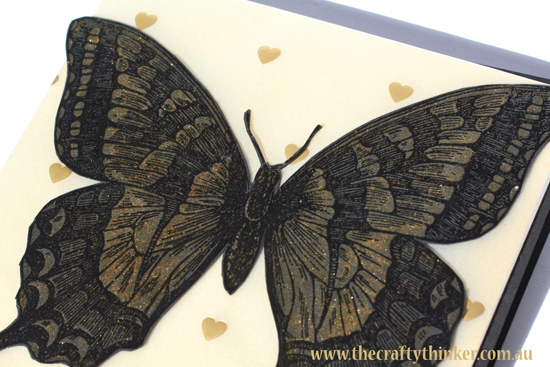 I had been pondering what to do next with the swallowtail and was thinking of some sort of Out of the Box die cut again but once it had its coat of gold I knew I was going to fussy cut it. This time I've made a 5.5" twisted easel card (instructions below) and have been able to use the entire butterfly image! 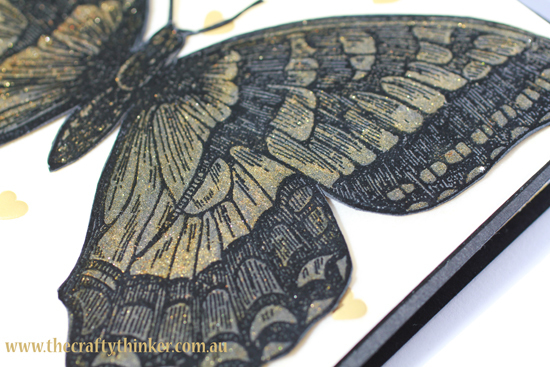 To hold the card open, I've made a black and gold butterfly with the Butterflies Thinlits and Bold Butterflies Framelits and popped it onto a Dimensional. The bottom layer is Basic Black and the top (filigree) is cut from Gold Foil Sheet. Since I still haven't restocked my supply of Black Candy Dots (! ), I followed the sage advice that Cheryl Algie provided in her comment on my Black Gold and Vellum card and used a Sharpie on some Basic Rhinestone Jewels to produce lovely black embellishments! Thank you Cheryl! Some of you may be wondering how I invisibly adhered the vellum - especially the sheet with the little hearts. The answer is: I wrapped the vellum around pieces of Gold Foil Sheet and stuck it down at the back. But then, won't that show and look ugly from the back in that top corner? Well, yes, it would - so I put a piece of black cardstock on the back to cover it all up! Black and Gold is such a class combination! Cut a piece of A4 black cardstock to 11" x 5.5"
Score at the half way point ie 5.5"
On the front of the card only, score diagonally from the bottom left (closest to the fold) to top right corner.. Fold down on this scoreline to create a mountain fold. Cut a piece of Gold Foil Sheet to 5.25" square. 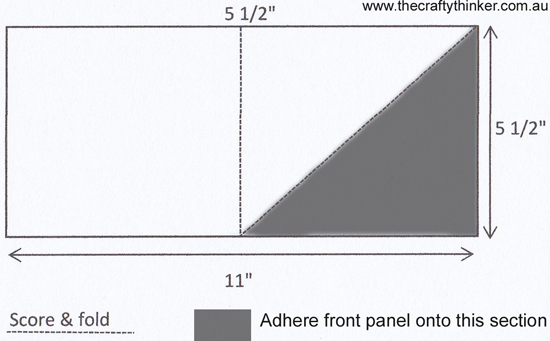 Cut a piece of Fancy Gold Foil vellum to 5.75" and place face down onto the work surface. Place glue close to the edges on the back of the foil sheet. Place the foil sheet face down into the centre of the vellum sheet. (For the vellum piece for the front of the card only) - cut a piece of black cardstock to 5.25" square (or whatever size is appropriate for your project) and adhere to back of gold foil sheet to hide the untidy edges of vellum. If you would like to visit my online store, click on a product image below.